Your website is the face of your business in the online world. You want your site to make a great first impression while enticing those that find it to explore your site and learn about your products and services. If you have a website that looks dated or is dated, you could be losing out on a large potential of clients. 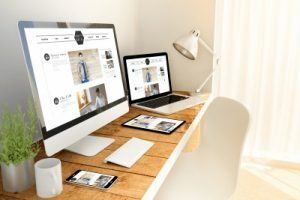 Users want responsive websites that they can view on multiple devices and for your best interests, you want to reach as many potential clients as well. So, if your website isn’t cutting it, you may want to consider a website redesign and the professional website designers at Design & Promote can redesign your site to make an impression in today’s digital world. If you have any questions about our website redesign services in Naperville or if you would like to learn more about our other web solutions such as digital marketing and hosting, give us a call today at 630-995-7109. You can also fill out the contact form located on this page and we will return your inquiry as soon as possible. Having a responsive website redesign will open the door to a variety of opportunities to gain new clients. Your website will be easily viewable on multiple devices, ensuring your content can be reached by more users. It also assists your site in SEO as Google and other search engines have a preference for mobile-friendly sites. It will also help you gain more traffic by being accessible on more devices. Aside from the visibility aspect a responsive redesign brings, your site will get a much-needed update and facelift. This can help improve brand recognition and convey your marketing message in a clear and concise manner. It will also help with website security, helping your users feel more secure when they are on your site, giving out information to you, or purchasing products. To learn more about a professional website redesign in Naperville or if you would like to know more about our other services, call us today at 630-995-7109. Or simply fill out the contact form on this page and we will respond shortly.